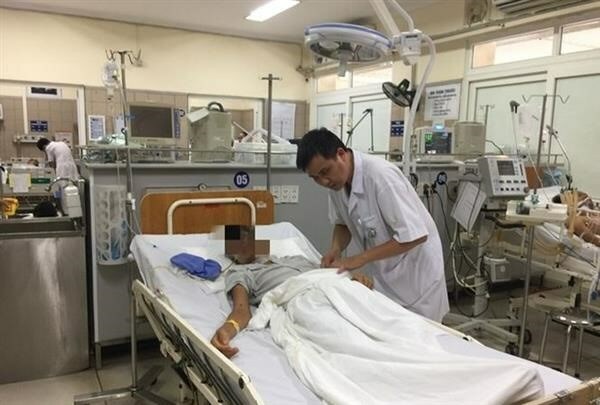 The Poison Control Centre at Bach Mai Hospital in Hanoi has reported an increasing number of people being hospitalised due to drinking. The centre receives two to three cases of alcohol poisoning every day. A 28-year-old man was diagnosed with acute pancreatitis because of alcohol abuse. His condition is no longer critical but he still needs to be monitored. A 27-year-old man who was also being treated at the Poison Control Centre had been admitted to hospital after vomiting and fainting at a year-end party. According to the patient, he and a group of 12 friends had drunk nine half litre bottles of rice wine. Many patients were admitted to hospital in a dangerous state. According to Dr Nguyen Anh Tuan, at 2 am on January 31, they received a man who had a problem with heart rate, blood pressure, and potassium level. Abusing alcohol will lead to various problems with the liver, nervous system and immune system. Still, many think genuine alcohol brands will not create harm. Some other patients were poisoned with fake spirits that contain methanol after drinking from bottles that have no labels or clear point of origin. Fake alcohol with methanol is even more lethal but the progress is slow and patients will only see the symptoms one or two days later. "Alcohol is the main factor for more than 200 diseases. Among hazardous substances, it causes the most diseases," said Dr Nguyen Trung Nguyen. "Many patients who were poisoned by methanol suffer from brain damage. Even though they survived, they were unable to work."